Where do you usually get YOUR ideas for meals? Cookbooks? Food blogs? Pinterest? But today, my idea for dinner appetizer came from an unlikely source: a quick chat before a meeting. Even before a fellow foodie was finished enthusiastically describing this dish to me, I had already planned my trip to the store to get the necessary ingredients. I knew from her description that this one was a “keeper”. Just before serving: Melt butter in large fry pan. Add onions and sauté briefly. 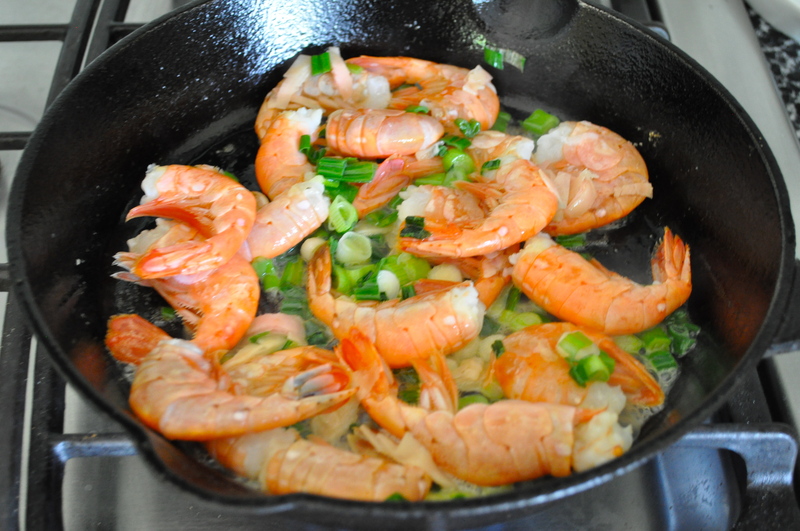 Add prawns and sauté only until lightly opaque. 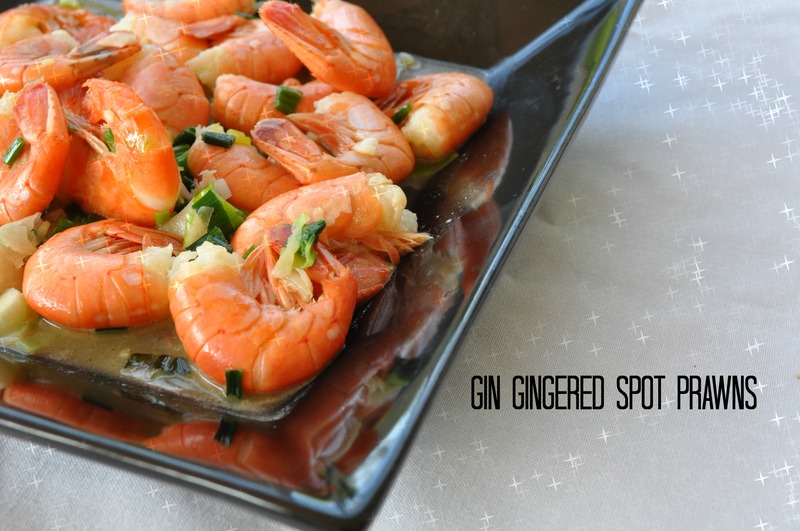 Add ginger and gin and continue to cook for a minute or two longer, just until prawns are opaque. Do not overcook. Serve with toothpicks or in scallop shells (or in my case, with lots of napkins!) Pass warm bread for dipping into the sauce. 1. For more people, if you increase the number of prawns, you must also increase the amount of sauce. There must be plenty for dipping. 2. We always serve our prawns peeled. Always. Except for tonight apparently. I was so anxious to get this dish started, that I only gave the recipe a cursory glance and later read that the prawns should be peeled. Oh well. 3. Drizzling in a little of the pickled ginger juice for extra flavour was also recommended to me. Good idea. It really gave it more of a punch. 4. I used our local artisanal Victoria Gin, made in Victoria, BC. You really must taste it to believe it. The greatest reward of creating in the kitchen is being able to gather with friends and family around the table to share my offerings. Sharing ideas for serving food is simply something I enjoy. Today I discovered that someone who is as passionate about teaching young children as I am also shares my passion for cooking. Thanks for sharing this dish, Maureen! 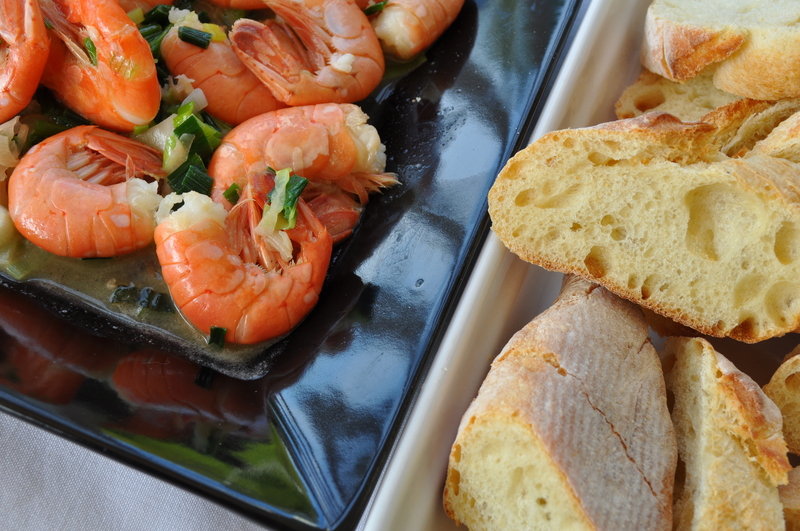 This entry was posted in appetizers, seafood and tagged appetizer, gin gingered prawns, prawn appetizer, prawns with gin and ginger, sauteed spot prawns, spot prawns, Victoria Gin, Victoria Spirits. Bookmark the permalink. Absolutely delightful: reminds me of the oft tableside cooking in most restaurants yesteryear! What fun!! Now, i would peel the prawns, but leave on the tails and, methinks, everyone would be happy!!! So simple 🙂 ! You’re so right! The cookbook was published in 1995 so this recipe is an oldie but a goodie. We’ll be sailing in the Broughton Archipelago this summer, and I’m envisioning making this dish on the boat with fresh-caught prawns. Hope you do not mind my using and passing on a ‘oldie but a goodie’! Hmm: hate to tell you, but my memories go back longer than that as do my cookbooks and recipes 😀 ! Have a wonderful sail when the time comes . . . Thank you, and of course you can pass it on. Food, and food ideas, are for sharing!